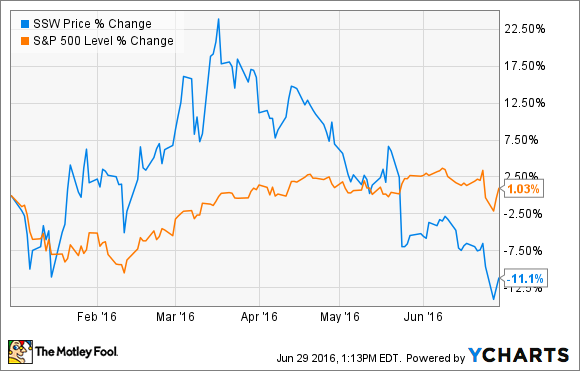 Why Has Seaspan Corporation's Stock Been a Sinking Ship in 2016? The containership leasing company is down 11% so far this year. We are halfway through the year and the company's stock is vastly underperforming the market, and has been steadily sinking even though the broader market has largely been on the upswing. Here's what has been dragging the company's stock price down this year. Weak global trade growth and overcapacity have created a swell of uncertainty in the global shipping marketplace. Shippers are struggling to make money, which is forcing them to explore options to reduce costs. This has led to a wave of mergers and acquisitions in the sector, while others are seeking relief on charter rates to reduce debt. For the most part, Seaspan Corporation has been unaffected by the turmoil around it. Its long-term time charters, which have an average of five years remaining, support its cash flow and provide visibility. That said, one of its customers did recently reach out, asking for a lifeline by seeking a 30% reduction in its charter rate. While Seaspan Corporation has refused to negotiate, the market is worried that it might not be able to avoid doing so if its customers start sinking. Meanwhile, the weak market is making it tough for the sector to charter vessels, whether those be newbuilds or vessels coming off contract. In fact, according to Gregory Zikos, the CEO of rival Costamare Inc. (NYSE:CMRE), "charter rates and asset values are at historically low levels." Overcapacity is also weighing on charter rates, with the industry's idle fleet now up to 7.4%, which is the highest it has been since the financial crisis. Weak demand for charters is a potential problem for Seaspan Corporation because it has two unchartered newbuilds scheduled for delivery next year. Meanwhile, its GCI joint venture also has two unchartered newbuilds, vessels the company ordered based on estimated future demand that hasn't materialized. Costamare is in the same boat, with five of its remaining newbuilds currently unchartered. Instead of driving growth, these vessels could sink earnings if they are still unchartered at delivery. While Seaspan Corporation's business model has largely insulated it from the current storm in the shipping sector, that has not kept market fears from weighing down its stock price. Not only is the market starting to worry that the company's charters might not be a sure thing, but the company has several unchartered newbuilds scheduled for delivery next year. These fears are not likely to abate until charter rates stop sinking, which won't happen until global trade growth starts to improve.